I would love to do this recipe, but can’t find half & half in my part of my country. I think I’ll substitute it either with 5% or 15% light cooking cream. By the way, we are going back to Czech Republic for the 4th time in 5 years 😉 I always find an excuse to go back, like “Oh, I found cheap tickets to go to Germany, but we will arrive in Prague!”). Also, I want to practice my Czech words/sentences and someday speak this wonderful language. We will arrive in Prague, then go to Karlstejn (day trip), Cesky Krumlov, Ceske Budejovice, Tabor, Trebon, …Do you have any favorite towns/cities in Bohemia ? We will stay close to the German border since we will be heading off for Nuremberg/Rothenburg afterwards. We’ve already been to Plzen, Kutna Hora, Hradec Kralove, Brno, Olomouc and, of course, Prague. Wow that is so great you are going back to Czech. I hope we can go soon as well. You have seen some amazing places. And you will see some more this trip. Since I am from Brno I am more familiar with Moravia region. I would recommend seeing Hluboka nad Vltavou castle. It is so pretty. And you will LOVE Karlstejn. Tried it today! My daughter LOVES it! Thanks for the recipe! I finally made the kure na paprice last week. I was all out of hungarian paprika (there is only one brand I trust and love! ), I had to go to Montreal to get some (8 hour-drive from where we live). I made it with half heavy cream/half milk. It was delicious, the sauce was creamy, silky and felt almost like a cloud (if that makes sense!). Thanks for another great recipe. We are never disappointed when I cook your recipes! Wow Julie, that is a dedication. 🙂 Is it expensive to have amazon to ship it to Canada? I wonder if that would be cheaper than driving so far. Thank you for all your nice comments. I truly treasure each one of them. I tried to order the paprika from Amazon.com, via your store, but I couldn’t place the order since I live in Canada. I think there are restrictions when it comes to food items…I also tried the “Better than bouillon”, didn’t work either! Thanks a dik for this site! You are great! When my mom passed away i was so sad she never taught me how to cook czech but thanks to you i could do this!! Btw i think it is pronounced as in czech in italian/english, with a hard k-sound. I made the noky (hard work) and sauce with chicken breast (cooked it shorter) was heavenly. Cant figure out how to post pic on here…. Btw what is that flour you are using? What is it called in czech? Hruba? Wondra flour is more course and also called instant flour. It would be equivalent of polohruba mouka since it is not as course as hruba flour. Made this a couple months ago. My family loved it . Making it again soon !!!! I’d say i think i like this better than my grandmas but havent had hers in a few years. 🙂 That makes me happy to hear! I made this delicious recipe last night for 14 people! Everyone loved it! We always called the gnocchi “shkoobanky” when my grandma made them. She had a special tool that she hooked onto the rim of the pot of boiling water and put the dough into it. It was round and had lots of holes in the bottom, made out of metal. So when you stir the dough little pieces break off and drop into the boiling water. Do you know what I am describing? Is it available for sale anywhere? Thanks again for this great recipe! I am sorry, but I don’t have recipes written down. But we are working on a cookbook where we will have all these recipes. Yes i know very well it originated in Hungary. We used to be part of Austrian Hungarian empire so many dishes are created from that time. There are many different varieties for each dish. This is how we cook it in our family. Last year I went to Budapest and had this dish and it was very delicious yet different. I always make sure to use Hungarian paprika. I use word paprikash, because that is how this dish is named in USA. Thank you for admiting that part of the old Czechoslovakia was Hungarian territory. I came from old Komunist Czechoslovakia and at that time, I would not find one single Czech person who would admit to have anything to do with Hungarians at all! I broke down and decided to give it a try. I followed everything else in the recipe though, and I tempered the coconut milk with the paprika soup so it would not break down and then mixed it in and continued cooking. Oh my goodness it was so amazing. Now I want to try the recipe with the half and half as I am sure it will be even better! Thank you for the wonderful recipes. I will try some of the others soon. Yay! I am glad to hear you enjoyed it! I hope my other recipes will be success as well. I would like to make this dish soon. Do you have a recipe for the dumpling thing to go with the chicken?? On my website I have gnocchi and dumplings. In category sides. 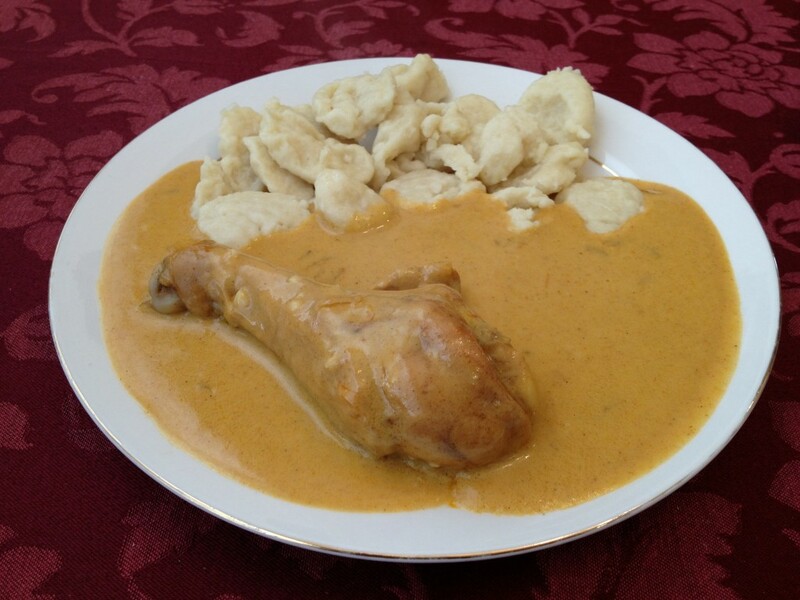 My mother, the daughter of Bohemian immigrants, was not a big Czech cook, but she did make Chicken Paprikash. It was one of our favorite dishes. She made it slightly differently; she added sour cream instead of half and half and she added diced green peppers with the onions. She would use a cut up chicken vs. just drumsticks. And, since we didn’t like dumplings, she would sometimes serve it over rice. But it was still delicious! I’m so glad that I came across your cookbook thanks to fellow classmates of Czech descent. You share the name Janáček (Little John, or Johnson) with the great Czech composer Leoš Janáček (1854-1928). Check out his Sinfonietta (you can google videos of it). The opening fanfares, for 12 trumpets, was played at the beginning and end of every broadcast day on Czech radio during the dark days of the Nazi occupation, as a sort of secret message to the Czechs to keep up their courage and resistance. Ahoj Jim, hm that would be bummer if they don’t sell the original ones in the stores. Thank you for the link. I got big bag from Hungary when I visited so that should last me some time. Nothing beats real Hungarian paprika.